This is the first in a series of blogs about the daughters of James McGregor (1833-1917) and Margaret McPherson (1839-1860) - The McGregor Sisters. 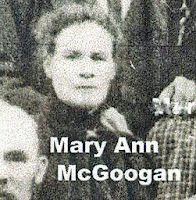 Interest in this project was sparked when I was recently given a photo of the McGregor Family by my Aunt. Then, as if to give the project a gentle push, two weeks later the Society of Australian Genealogists (SAG) contacted me advising that they had in their keeping James and Margaret's Family Bible. The Bible proved to be an invaluable find, as inside there was a hand written list of family events, including the birth dates and places of all the McGregor sisters. Writing and researching the story of each of the McGregor Sisters, will I believe, be a journey of discovery, and I hope it will lead to connections with others who are researching this family. Mary Ann and her family continued to live in the mining town of Araluen until 1870. The family bible shows the family then lived at Shoalhaven River until around 1877, when James and Margaret packed up their belongs and moved their family to Booth Street, Balmain Sydney. Mary Ann would have been around 16 years of age at this time. One has to wonder, how the McGregor sisters adapted to life in the city after spending most of their childhood in the country. On August 14 1884 Mary Ann married Hugh James McGoogan, in Balmain. Hugh and Mary Ann continued to live and raise their family in Sydney. Their children were: Margaret Mavis, John, James, Hugh and George. At the age of 80 Mary Ann passed away peacefully while staying with her daughter. Her husband Hugh passed away the following year. *Australian Heritage http://www.heritageaustralia.com.au/search.php?state=NSW&region=103&view=729, viewed 22/11/13. 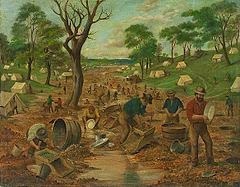 **1861 'GOLD FIELDS. ', Freeman's Journal (Sydney, NSW : 1850 - 1932), 27 July, p. 3, viewed 25 November, 2013, http://nla.gov.au/nla.news-article115763269.